Maddur is located at 12°35′03″N 77°02′42″E﻿ / ﻿12.584169°N 77.0449°E﻿ / 12.584169; 77.0449. It has an average elevation of 662 metres (2175 ft). As of 2001[update] India census, Maddur had a population of 26,456. Males constitute 51% of the population and females 49%. Maddur has an average literacy rate of 68%, higher than the national average of 59.5%: male literacy is 73%, and female literacy is 63%. In Maddur, 12% of the population is under 6 years of age. Maddur has been recently famous for its tender coconut cultivation. Nearly 300 trucks of nuts are daily sent to the other states of India such as Punjab, Maharashtra, Kolkata, Goa, Hyderabad and Ahmedabad. Small towns near Maddur consume more and more tender coconuts daily. Maddur has been recently named as Tender coconut capital of India. Maddur, 18 km from Mandya and 8 km from Mudagandooru, claims legendary importance because it was originally known as Arjunapura after the Pandava Prince who is believed to have come here on pilgrimage. In more recent authenticated history, the town suffered heavily during Tipu's wars with the British. Maddur fort, in fact, which had been fortified by Hyder, was dismantled by Lord Cornwallis in 1791. Among the important temples here, thankfully still existing, is the Narasirnha temple of the Hoysala period whose 7 ft high image of Ugra Narasimha made of black stone is believed to be the best of its kind in the State. Maddur's marvelous Varadaraja temple is an early Chola or pre-Chola structure. Its 12 ft high Alialanatha deity is elaborately carved both in front and on the back with unusual features which has led to the Kannada saying 'Ella devara munde nodu Allalanathana hinde nodu' - 'All other idols are to be seen from the front but Allalanatha is to be seen from the back'. Kokkarebellur – Kokkare Bellur, is a famous bird sanctuary located in maddur taluk. Its 12 km from Maddur town. Maddur, incidentally, is also famous for the Maddur Vade – a delicious fried snack made of a variety of pulses. A Jain temple dated 8th Century AD was discovered in Arathipura, Maddur by Archaeological Survey of India. The structure is built with bricks and stones and is 100 feet long and 40 feet wide. Shilabalikes (stone sculpture of young women), Dwarapalakas (gatekeepers) and a statue of Lord Bahubali (3 foot wide, 3.5 feet tall) were also discovered in the excavations.. In 2016, Archaeological Survey of India (ASI) excavated another 13 ft (4.0 m) statue of Bahubali made in the 3rd – 9th centuries on another hillock located opposite the basadis in Arthipura. Excavation work is expected to be completed by 2018. ^ Maddur market gives Coconut growers a fair deal. ^ "Maddur, India - List of All Places". PlaceBeam.com. Retrieved 2 April 2016. 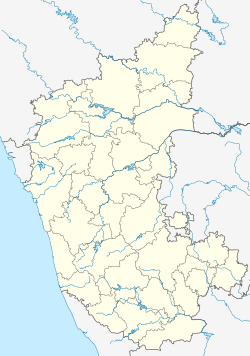 Wikimedia Commons has media related to Maddur, Mandya.